First finely grind the gingersnaps in a food processor or blender. Pour into a bowl and stir in melted butter, light brown sugar, salt. You can also add the finely chopped pecans for richer and earthier flavor. Next lightly coat a 10-inch springform pan with either butter or cooking spray, as to avoid sticking latter, before pressing the gingersnap crust into the bottom and sides; then refrigerate for at least 30 minutes. Preheat the oven to 350 degrees Fahrenheit (176 degrees Celsius). While waiting, start making the pumpkin cheese filling by first beating the cream cheese in a stand mixer until soft, scraping the sides once. Mix in the pumpkin puree, scraping the sides once or twice. Next, add the eggs one at a time to allow each egg to mix in, then add the sour cream and mix. With the mixer on low, add the light brown sugar, cinnamon, allspice, vanilla and nutmeg. Thoroughly scrape the bowl and hand mix to ensure everything is smooth and well blended. After the crust is well chilled, pour the filling into the pan and gently smooth the top. Set the pan on a baking sheet and bake until the filling is no longer soupy but still slightly jiggly like a pudding for about 40-50 minutes. Turn off the oven, open the door slightly and let the cheesecake sit in the oven for another 15 minutes. When finished, remove the pumpkin cheesecake from the oven gently and rest for at least 30 minutes before covering it with plastic wrap. Allow the pumpkin gingersnap cheesecake to chill for at least 4 hours or overnight as the various spices harmonize their flavours. Mix light brown sugar, heavy cream, butter, vanilla and salt in a medium saucepan over medium-low to medium heat. As it cooks, whisk the sauce gently until thickened for 5 to 7 minutes. Let the sauce cool before until needed or refrigerate for later use. Before spreading over the pumpkin gingersnap cheesecake, allow it to warm to room temperature or gently reheat in microwave. 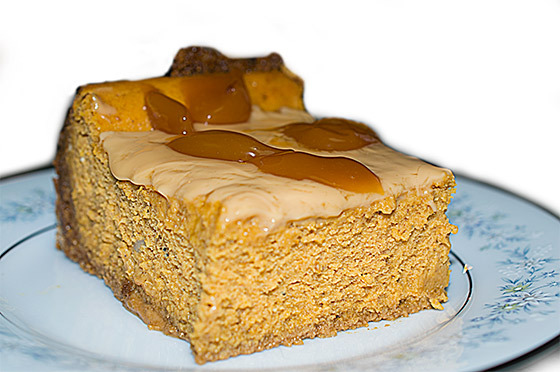 Now you can enjoy a Bear’s Den Pumpkin Gingersnap Cheesecake with your friends and family for the holiday season!